In my earlier post on "The way its' always been done" I talked about the insurance company that stored documents for 30 days 'to let the ink dry' because that's the way it had always been done. I got a call from my father recently who had read this post and said it reminded him of something he heard in a similar vein. Many years ago a local dry cleaning company near him got bought out or taken over. The first thing the new owners did was send in the "Time & Motion" boys to work out if the business was operating the most efficient way. ('Time & Motion' sort of dates the story a bit, but the principle is still sound). The business had a delivery truck which would take out the dry cleaned clothes/sheets/napkins etc to the local businesses, drop them off and pick up dirty stuff to be cleaned for the following day. When the T&M guys charted the route the driver went they noticed that he took a very indirect route which would cross and double back on itself several times. Their calculations indicated that the truck was actually covering almost 3 times the distance a more sensible and direct route would take. When they asked the drive why he took that particular routing he replied (you guessed it) "That's the way it's always been done". So of course a little more investigation was required. It turns out that this route had been set in stone many years ago. So long ago, in fact, that the delivery truck at the time was actually a horse and cart. First thing in the morning - when the horse was fresh and the cart was full, they were able to tackle some of the steeper roads in the area to make deliveries. Later in the day - when the horse wasn't so fresh, but the cart still had a heavy load (remember the deliveries also picked up more items for cleaning) the horse would labour to climb the steep hills, so the route was taken which would minimise the climbing it had to do. This resulted in a the tortuous path which criss-crossed and double backed. When the transfer to motor vehicle had taken place years back no-one had questioned the routing and the new delivery driver had gone exactly the same way. I don't have figures around this but I imagine the savings in fuel, time and wear and tear on the vehicle would have justified the cost of running a T&M study into this aspect of the business. Yet another case of business process analysis being something that you can't afford not to do. 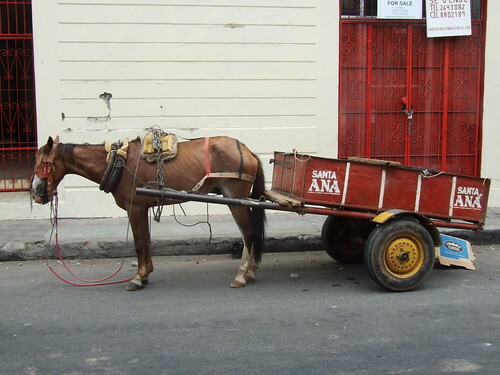 Where's the 'horse and cart' in your business? Reminder: 'The Perfect Process Project - An eBook' is released soon. Don't miss the chance to get this valuable insight into how to make business processes work for you.